The Aesthetics of Composition in Abstract Painting: Artwork of the month: Berthe Morisot. Artwork of the month: Berthe Morisot. I have paused periodically in front of this paining for the last 6 years. I don't find it to be a masterwork, nor do I see it as a great stride within an ism. As far as the subject matter of this work goes, hello boring. I do however truly admire the painterly brushstrokes, their precision in intent, and the way dark under light under dark is executed. You can see this painting at the Minneapolis Institute of Arts. 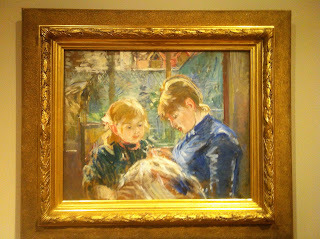 "the Artist's daughter, Julie, with her Nanny"
"Real painters understand with a brush in their hand."